This is a medium bulky weight hat designed to fully cover the ears. It's about the same length as a long round cap. The variegated sections are a blend of kid mohair and tussah silk. The pink and thin accent stripes are tussah silk. The gold is the natural color of the silk. The olive green thin accent stripes and circle at the top are kid mohair. The flower is bamboo with a kid mohair center. The bamboo looks a lot like silk, but not quite so shiny. 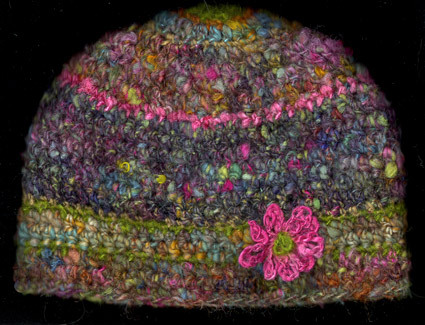 This is a very nice, soft hat that looks a bit like a Monet painting.